This article is about the year 1517. 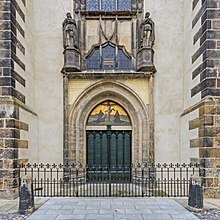 Martin Luther publishes his 95 Theses on the door of Wittenberg Castle Church. Year 1517 (MDXVII) was a common year starting on Thursday (link will display the full calendar) of the Julian calendar. January 22 – Battle of Ridaniya: The Turkish forces of Selim I defeat the main Mamluk army in Egypt, under Touman Bey. February 3 – Cairo is captured by the Ottoman Empire, and the Mamluk Sultanate falls. March 16 – The Fifth Council of the Lateran ends. August 15 – Portuguese merchant Fernão Pires de Andrade meets Ming Dynasty Chinese officials through an interpreter, at the Pearl River estuary and lands, at what is now in the jurisdiction of Hong Kong. Although the first European trade expeditions to China took place in 1513 and 1516 by Jorge Álvares and Rafael Perestrello, respectively, Andrade's mission is the first official diplomatic mission of a European power to China, commissioned by a ruler of Europe (Manuel I of Portugal). October 31 – Protestant Reformation: Martin Luther publishes his 95 Theses (posting them on the door of the Wittenberg Castle Church). Grand Prince Vasili III of Muscovy conquers Ryazan. A third outbreak of the sweating sickness in England hits Oxford and Cambridge. ^ "Henry Howard, Earl of Surrey | English poet". Encyclopedia Britannica. Retrieved April 10, 2019. This page is based on the Wikipedia article 1517; it is used under the Creative Commons Attribution-ShareAlike 3.0 Unported License (CC-BY-SA). You may redistribute it, verbatim or modified, providing that you comply with the terms of the CC-BY-SA.